A Christmas treat for chocolate fans! These festive brownies are laced with brandy-soaked cranberries, pecans and mixed spice. Preheat the oven to 180C/350F/Gas 4 and line a 30x20cm/12x8in tin with baking parchment. Gently heat the brandy then add the cranberries and leave to soak while you prepare the brownie mix. Melt the chocolate and butter in a bowl over a pan of simmering water, or in the microwave. Stir gently until smooth then set aside to cool slightly. Whisk the chocolate and butter mix into the eggs then gently fold in the flour, mixed spice, pecans, cranberries and brandy until fully incorporated. Pour into the prepared tin, smooth the surface then bake in the oven for 25-30 minutes, or until the brownie is firm to the touch. 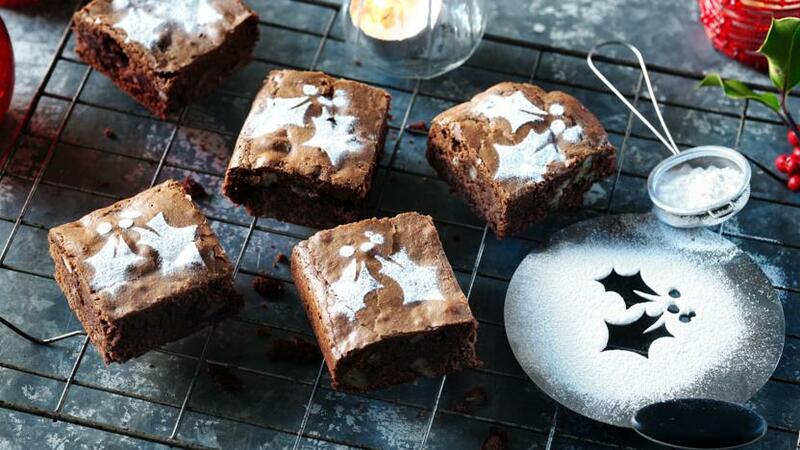 Once cool, cut into squares and dust the tops with icing sugar.